Much has been said lately about how to do evangelization. I’ve contributed a bit to that myself. Now I begin to think that, instead of always stressing niceness, it might be good to give tough religion a try. That idea was inspired by a reading of Eric Metaxas’s biography of Dietrich Bonhoeffer, the Lutheran theologian and pastor executed by the Nazis near the end of World War II for involvement in the plot against Hitler. Metaxas’s book, Bonhoeffer: Pastor, Martyr, Prophet, Spy (Thomas Nelson), is a tad too worshipful for my taste, but it contains a wealth of information about this iconic religious figure of the 20th century and, best of all, quotes generously from his writing. 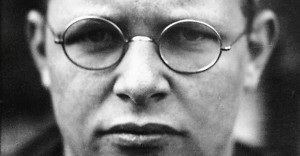 The circumstances of his death aside, Bonhoeffer may be best remembered now for his scathing comments on “cheap grace.” That was the name he gave to the delusory self-justification many Christians bestow upon themselves with little support for it. Well-intentioned people, Catholics included, sometimes argue that for the sake of evangelization the churches should water down the gospel: a little trimming here, a little prudent silence there, and behold–those pew-sitters who disappeared years ago will come flocking back. I’m reminded of something that somebody else, not Bonhoeffer, said: “If any one will not receive you or listen to your words, shake off the dust from your feet as you leave that house or town” (Mt 10.14). It might even be a good way to get their attention–which is how evangelization begins.